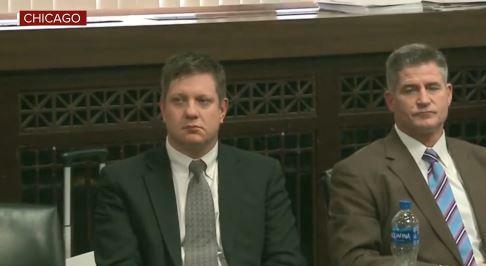 CHICAGO -- A jury has found a white Chicago officer guilty of second-degree murder and multiple counts of aggravated battery in the 2014 shooting death of black teenager Laquan McDonald. It's the first time in half a century that a Chicago police officer has been convicted of murder for an on-duty death. The jury began deliberating early Thursday afternoon following closing arguments in the trial of Jason Van Dyke. The trial opened on September 17 with jurors seeing police video of the fatal encounter. The shooting and the city's delay in releasing police footage of it sparked outrage across the city in 2015, with prolonged street protests held everywhere from downtown to smaller neighborhoods. The case put the city at the center of the national conversation about police misconduct and excessive force, and also led to a federal government inquiry and calls to reform the Chicago Police Department. Van Dyke was charged with first-degree murder, 16 counts of aggravated battery -- one count for each shot he fired at McDonald -- and one count of official misconduct. Jurors had the option of convicting the officer of second-degree murder. He was found guilty of second-degree murder and all 16 counts of aggravated battery. He was found not guilty of official misconduct. The second-degree murder conviction required a finding that the shooting was unnecessary and unreasonable. The guilty verdict means jurors found Van Dyke believed his life was in danger but that the belief was unreasonable. A judge revoked bail for Van Dyke and he was taken into custody. Speaking to reporters Friday evening, Laquan McDonald's great-uncle the Rev. Marvin Hunter, who has acted as a spokesperson for the family, called the verdict a "victory for America." "Laquan McDonald represents all of the victims that suffered what he's suffered across the country," Hunter said. Hunter said he feels compassion for Van Dyke's family, but said Van Dyke has never asked Laquan McDonald's family for forgiveness. After the verdict, protesters that had gathered outside the courtroom erupted in cheers, chanting "Justice for Laquan." Crowds also gathered in front of City Hall and planned to march north. One woman carried a sign that read, "Finally Justice" and the hashtag, #BlackLivesMatter. Chicago police had prepared for any possible unrest in the aftermath of the verdict, CBS Chicago reported. The department amped up patrols, many officers have been assigned to 12-hour shifts and supervisors have canceled days off. Tactical officers and special operations units will be heavily armored. Several schools and offices closed early on Friday. Van Dyke didn't show emotion after the verdict, CBS Chicago reports. Van Dyke stood up from the defense table and then put his arms behind his back as two deputies led him away. He could be sentenced to as little as probation and as long as 20 years in prison for second-degree murder. Each aggravated battery conviction carries a sentence of 6 to 30 years in prison. Police encountered McDonald on October 20, 2014, after being called to a report of someone breaking into vehicles. At one point, McDonald punctured a squad car tire with his knife. When Van Dyke arrived, police had McDonald mostly surrounded on a city street and were waiting for an officer to arrive with a Taser to use on the 17-year-old. During closing arguments, prosecutor Jody Gleason pointed to video of Van Dyke shooting McDonald 16 times as the teenager held a knife in his right hand. She noted that Van Dyke told detectives that McDonald raised the knife, that Van Dyke backpedaled, and that McDonald tried to get up off the ground after being shot. Gleason said, "None of that happened. You've seen it on video. He made it up." Van Dyke's attorneys said he was afraid for his life and acted according to his training. Defense attorney Dan Herbert told the jury Thursday that the video doesn't tell the whole story and that it's "essentially meaningless based on the testimony" jurors heard. Herbert specifically pointed to testimony from Van Dyke's partner that night, Joseph Walsh. Walsh said he saw McDonald raise the knife, even though the video doesn't show that. "The video is not enough," he said. He added: "It shows a perspective, but it's the wrong perspective." Herbert did not note that Walsh is one of three officers charged with conspiring to cover up and lie about the circumstances of the shooting to protect Van Dyke. Van Dyke took the stand at trial and said in sometimes emotional and sometimes defiant testimony that what he saw did not unfold the way it did on dashcam video. Van Dyke said he yelled "drop the knife" but McDonald "never stopped" advancing and didn't drop the knife. "His face had no expression, his eyes were just bugging out of his head. He had these huge white eyes, just staring right through me," Van Dyke said. Appearing to choke back tears, Van Dyke said McDonald got about 10 to 15 feet away from him. He said McDonald waved the knife, and that's when he shot him. An autopsy shows McDonald had the hallucinogenic drug PCP in his system. "His back never once turned towards me," Van Dyke said. "He could have made a decision to turn and walk in the other direction; he could have dropped the knife and ended it right there." But prosecutors picked apart his story, asking why Van Dyke didn't step out of McDonald's path and pointing out that the video shows Van Dyke actually stepping toward McDonald. Speaking to CBS Chicago, jurors who identified themselves only by their juror numbers said they took a blind straw poll as deliberations began. Seven wanted to vote guilty, two not guilty and three were undecided. But by Thursday evening, the debate was between convicting Van Dyke of first-degree or second-degree murder, and they decided to return Friday morning to renew deliberations, one juror said. Ultimately, they said, they decided to convict on second-degree murder because Van Dyke believed his life was in danger, though he acted unreasonably. They said they watched the dashcam video several times and noticed how Van Dyke stepped toward McDonald. "He should have looked at other options -- for example, taking the time to back away, or just being patient -- waiting for the other vehicle to get there, a vehicle with a Taser, specifically," one juror said. "Instead of escalating the situation, he should have de-escalated." Multiple jurors said they didn't find Van Dyke's testimony to be credible, saying he couldn't remember details and that it appeared rehearsed. One said she didn't "buy it." Speaking to reporters after the verdict, Herbert said Van Dyke and his family were "relieved we're not looking at a death sentence" and said the verdict was not unexpected because of the local jury. He said he would continue to argue that Van Dyke deserved a change of venue. "We knew with a Cook County jury, we knew there wasn't a chance in the world we would come away with a complete not guilty," he said. Herbert called Van Dyke "a sacrificial lamb" offered by political and community leaders "to save themselves." He said it was a "sad day for law enforcement" because the verdict tells officers they cannot do their jobs. In a statement, the Illinois Fraternal Order of Police said the jurors were "duped into saving the asses of self-serving politicians at the expense of a dedicated public servant." "This sham trial and shameful verdict is a message to every law enforcement officer in America that it's not about the perpetrator in front of you that you need to worry about, it's the political operatives stabbing you in the back." Activist William Calloway said the verdict provided justice for Laquan McDonald, but said there was more work to be done to end excessive police force in Chicago and across the country. He called for Van Dyke to face the maximum sentence. "The defense tried to put Laquan McDonald on trial, but we have to make it clear and we've made it abundantly clear that the only criminal that night was Jason Van Dyke," Calloway said. Chicago Mayor Rahm Emanuel and police Superintendent Eddie Johnson urged residents to listen to each other as they react to the murder conviction. Emmanuel and Johnson said in a joint statement that, "The effort to drive lasting reform and rebuild bonds of trust between residents and police must carry on with vigor."